By Bogna Haponiuk and Kacper Pawlik. What are the hCG levels? 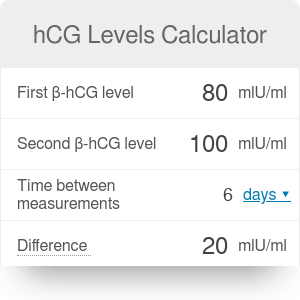 This hCG levels calculator is a tool for assessing whether an early-stage pregnancy is developing properly. It uses two results of hCG tests to determine the hCG doubling time, as well as the one- and the two-day increase of this hormone. In this article, we will explain what hCG is, what do the hCG levels mean and how to use the hCG doubling calculator. You will also learn the story of hCG pregnancy test and why taking the hCG diet is a bad idea. Finally, we will provide you with an hCG level chart that will help you interpret the results. Make sure to take a look at the pregnancy weight gain calculator, too! hCG, or human Chorionic Gonadotropin, is a hormone produced by the placenta during pregnancy. hCG interacts with luteinizing hormone/choriogonadotropin receptor (LHCGR) of the ovary and through this process stimulates the corpus luteum, the remains of the ovarian follicle which has already released an ovum. Thanks to this stimulation, corpus luteum produces the hormone progesterone till the moment when the placenta is mature enough to begin and sustain progesterone synthesis by itself. Progesterone, in turn, has an influence on the uterus. It prevents it from contracting and, furthermore, maintains the secretory uterine lining, providing a constant supply of the nutrients to the fetus. These effects ensure that pregnancy may develop physiologically without any problems. Extremely high levels of hCG can indicate a multiple (for example, twin) pregnancy. On the other hand, low hCG levels might be an indicator of an ectopic pregnancy. It means that the fertilized egg has implanted in a place other than the uterus. When there is no visible fetus on vaginal USG with hCG of over 1500 mlU/ml the ectopic pregnancy is highly probable. Moreover, a lack of growth or a drop of hCG levels may suggest a happening miscarriage. Apart from pregnancy, high hCG levels are characteristic for tumors and cancer of the ovaries or testicles. Both these conditions cause a release of this hormone into the body. We can calculate the risk of developing some of the human carcinomas - take a look at our lung cancer risk calculator! First hCG level (hCG₁). This is the result of the first test for hCG that you took. It is measured in mIU/ml. (IU - International Unit, a unit used to measure an amount (mass or volume) of a certain substance based on its biological activity or effect. Second hCG level (hCG₂). Similarly, this is the result of the second hCG test, taken after some time. Time between measurements (T). It is the number of hours that have passed between the first and the second measurement. Once you have provided our hCG levels calculator with these values, it will automatically calculate all the remaining numbers. Difference. It is simply the first hCG level subtracted from the second hCG level. The result should be positive; if not, it means that your hCG levels are falling. Percentage difference. Found as the difference between two hCG levels divided by the result of the first measurement, this value shows you the relative increase that occurred between the two measurements. Two day increase. Analogically to the one day increase, it measures the relative increase in hCG over two days. As a rule, hCG levels increase only for the first 14-16 weeks of your pregnancy. After a peak in the fourteenth week, the hCG results begin to gradually drop. Soon after delivery, the hCG levels go back to their regular pre-pregnancy value. Do you remember your due date? You can calculate it using our due date calculator. Remember that the "regular" values provided below are just a guide and are in no case equivalent to a doctor's consultation. In case of doubts, make sure to schedule an appointment! After the baby is born, doctors assess it with another chart called APGAR scale. You can visit our APGAR score calculator to learn more on this topic. hCG is a very reliable marker indicating the presence of a pregnancy. It can be detected in blood already eight days after the fertilization of the egg, while in urine, it can be found ten days after fertilization. Although hCG marker is very sensitive, you have to keep in mind that, if tested during these 8-10 days after the fertilization, it could give a falsely negative result. It means that in spite of the presence of a developing pregnancy inside a woman’s body, the pregnancy test may be negative, indicating, that the woman is not pregnant. Hillel Shapiro and Harry Zwarenstein developed the first version of the hCG pregnancy test at the beginning of the 1930s. They discovered that injecting urine of a pregnant woman (as we already know, containing hCG) into a Xenopus toad, caused the toad to ovulate. Needless to say, that before researchers fully understood the processes standing behind this phenomenon, the poor Xenophus toads were massively exported and used for pregnancy checking. The most popular hCG pregnancy test for an in-home use is the one requiring a sample of woman’s urine. A woman has to pee into a plastic cup and then place a small amount of urine, using a dropper, on a testing stick, or pee directly on a testing stick, depending on the producer. It is crucial to carefully read the instruction, included by the producer to the testing set, before taking the test to assure its effectiveness. The result appears typically after several (5 to 10) minutes. The advantage of the hCG blood tests is the possibility of measuring with them the change of the hCG concentration in time. This way, we can indirectly verify the correct development of the fetus and this is where our hCG levels calculator may come in handy. Do you plan on becoming a mother? You can calculate the times of your periods and ovulation with our period and ovulation calculators! This is one of the examples of false conclusions after clinical studies. The idea of adding hCG injections to a diet plan was created by Albert T. W. Simeons after his research on pregnant women in India. He reported that his patients on a calorie-deficient diet lost mostly fat tissue and not muscle mass. Therefore, he designed a dietary protocol of low-dose daily hCG injections combined with extremely low calorie intake – less than 500 calories per day. However, many later performed studies on the hCG diet did not find the same results. The effect of weight loss can be attributed entirely to a such low supply of calories (it is recommended for a normal adult to eat everyday products containing around 2000 – 2500 calories), while hCG injections can lead to many undesired side effects including depression, irritability, fatigue, edemas, swelling of the men's breasts, and forming of blood clots blocking blood vessels and leading to a possible heart attack or stroke. Food and Drug Agency (FDA) did not approve hCG for an OTC (over-the-counter) use and obliged the producers of hCG medications to put a label on their products noting that hCG is not effective for weight loss. Are you dreaming about losing some pounds? Why don’t you take an Omni Calculator weight loss trip! We have solutions that will help you at each step of your weight loss plan. First, you can check how much fat your body contains using body fat or body adiposity index calculators, then you can calculate how many calories you should eat with your meals each day with our calorie calculator to lose weight in a healthy way. Finally, we can back you up with your sports and keep you motivated with the burned calories calculator! You don’t need the hCG diet at all! Bogna Haponiuk and Kacper Pawlik. hCG Levels Calculator can be embedded on your website to enrich the content you wrote and make it easier for your visitors to understand your message.